(AP) ANKARA, Turkey - Turkey warned Tuesday that any Syrian military unit approaching its border will be treated as a direct threat, a serious escalation in tensions days after Syria shot a Turkish military plane out of the sky. Turkey's NATO allies expressed solidarity with Ankara and condemned the Syrian attack but made no mention of any retaliatory action against Syria. "The rules of engagement of the Turkish Armed Forces have changed," Prime Minister Recep Tayyip Erdogan said in a televised speech. "Any military element that approaches the Turkish border from Syria and poses a security risk and danger will be regarded as a threat and treated as a military target." 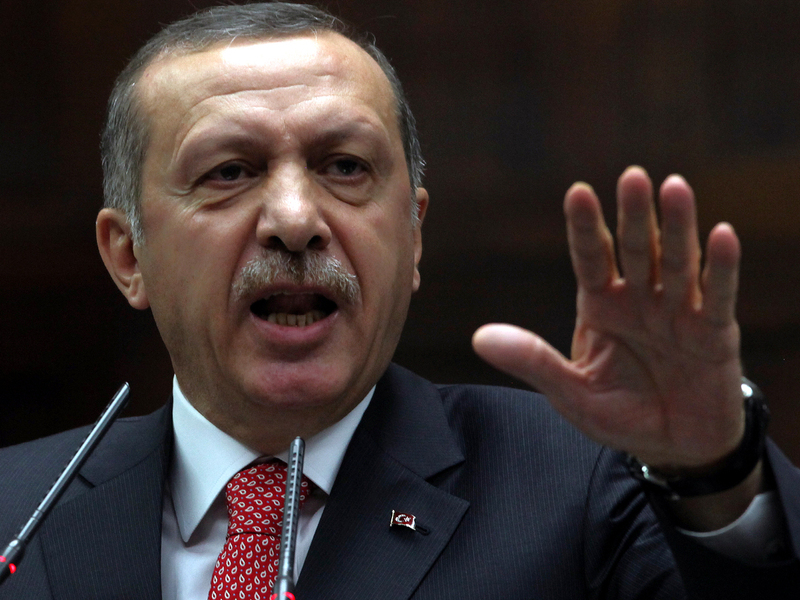 "No one should be deceived by our cool-headed stance," Erdogan added. "Our acting with common sense should not be perceived as a weakness." Syria insists the Turkish military plane violated its air space on Friday. Turkey says although the RF-4E reconnaissance jet had unintentionally strayed into Syria's air space, it was inside international airspace when it was brought down over the Mediterranean by Syria. Its two pilots are still missing. The head of the NATO military alliance called the downing of the jet unacceptable Tuesday after Turkey briefed NATO's North Atlantic Council on the incident. The talks were held under Article 4 of NATO's founding treaty, which allows a NATO member to request consultations if its security has been threatened. NATO Secretary-General Anders Fogh Rasmussen said the alliance condemned the Syrian attack "in the strongest terms" and expressed solidarity with Turkey but did not speak of any possible armed action against Syria. The Syrian opposition says Syrian President Bashar Assad's crackdown on an increasingly armed popular uprising has killed some 14,000 people since it began in March 2011. "It's my clear expectation that the situation won't continue to escalate," Fogh Rasmussen told reporters after Tuesday's meeting. "What we have seen is a completely unacceptable act and I would expect Syria to take all necessary steps to avoid such events in the future." Erdogan said Syria shot down the unarmed plane in international airspace without warning in a `deliberate' and `hostile' act. He said border violations in the region were not uncommon and Syrian helicopters had violated Turkish airspace five times recently without a Turkish response. The two countries share a 566-mile border. Syria said the downing was an accident caused by the "automatic response" of an officer commanding an anti-aircraft position who saw an unidentified jet flying at high speed and low altitude. Erdogan said Syrian forces also fired on a CASA-type search-and-rescue plane on Friday following the downing of the jet. It was not clear if the second plane was hit. The downing of the jet has aggravated tense ties between the two neighbors. Turkey has repeatedly called on Assad to step down as 33,000 Syrians have sought refuge in Turkey, fleeing a government crackdown on a popular uprising. The country is also hosting civilian opposition groups as well as members of the Free Syrian Army, which is fighting against the Syrian regime. "We will continue to support the struggle of our brothers in Syria at any cost," Erdogan said. Turkey, however, denies harboring armed Syrian rebels. The public anger in Turkey is largely muted and Huseyin Celik, a senior member of Erdogan's ruling party, said party members are against going to war. Fogh Rasmussen declined to answer a question about how long the Turkish jet loitered in Syrian air space before heading out to sea again, saying he didn't want to discuss details. Fogh Rasmussen has repeatedly said NATO would need a clear international mandate and regional support before it embarked on a mission in Syria. Last year, NATO launched air attacks on Libyan government targets only after receiving such a mandate from the U.N. Security Council, along with backing from the Arab League. But in Syria's case, the Arab League hasn't been able to agree on the need for military intervention. And Russia and China  both veto-wielding members of the Security Council  have consistently shielded Assad's regime from international sanctions over its violent crackdown on protests. They have called on neighboring countries to refrain from provocative actions that could spark a wider war.